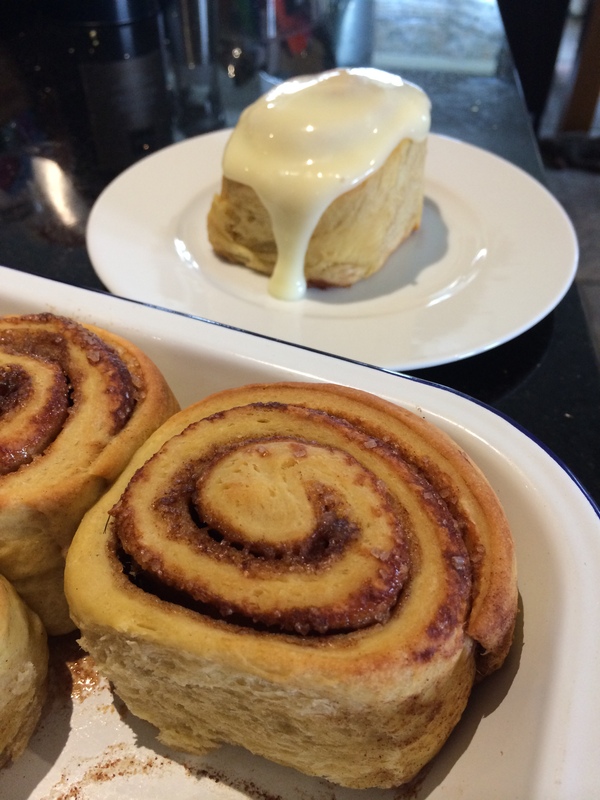 A little breakfast recipe here to ease back into the swing of things! 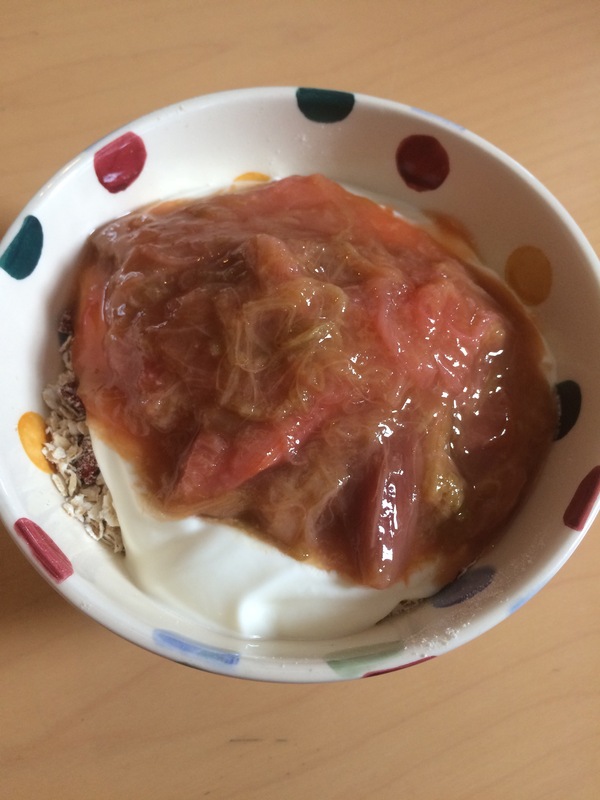 This Rhubarb and Orange Compote is a nice zingy way to pep up your yogurt and museli and gets the day off to a great start! I didn’t used to be a breakfast person. In fact I spent about 28 years avoiding the meal! Nowadays, however, I cannot get going until I’ve had a good breakfast and I know that a bad breakfast will hold me back the whole day, no matter how much I’ve enjoyed it! (I’m looking at you, croissants!). I need protein to kickstart me, sugary cereals and pastries do me no good at all. I tend to turn to eggs but some days you just don’t want anything cooked, a cool bowl of greek yogurt, fruit and museli is just perfect for me then! My love affair with rhubarb is well documented. I love the colour and the tartness. I think the combination of rhubarb and orange is just diving, a really zingy combination that hits your tastebuds and wakes you up! Perfect breakfast food! – Trim your rhubarb and chop it to about 2″ lengths. – Pop it in a small saucepan with enough orange juice to come about halfway up your rhubarb and the sugar or honey. 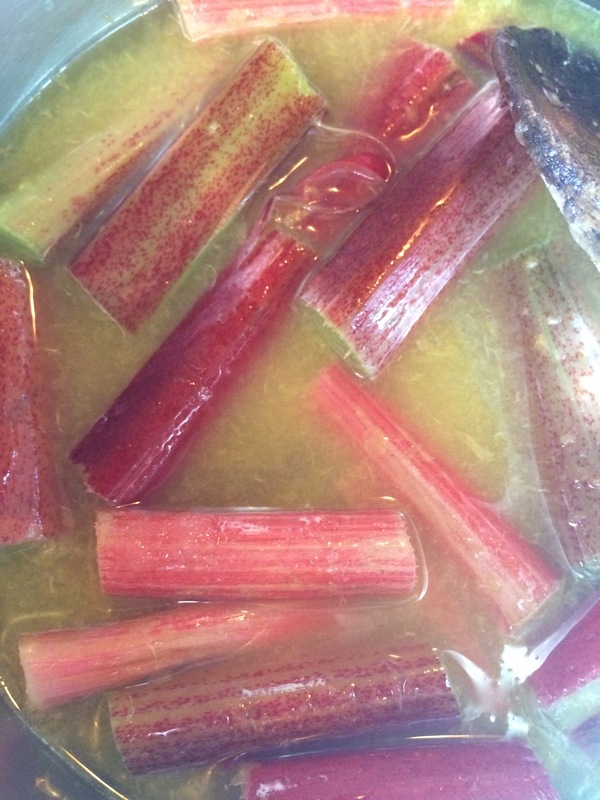 – Bring to the boil and simmer on a low heat for 10-15 minutes until your rhubarb is soft. – You can serve it warm but I like to prep this in advance for a cold breakfast. – Serve with greek yogurt and museli. I like to mix up my own museli according to my mood, this time it was oats, almonds, hazelnuts and goji berries. *You may find you can dial down or even leave out the sugar here if you like. The sugar in the orange juice may be enough for you, especially if you are using a juice from concentrate rather than fresh as it has added sugars already. I still have a painfully sweet tooth but I’m getting there cutting down slowly! My mother was a brilliant, sneaky mother. She found ways to get us to eat really healthy things and make it fun and tasty! 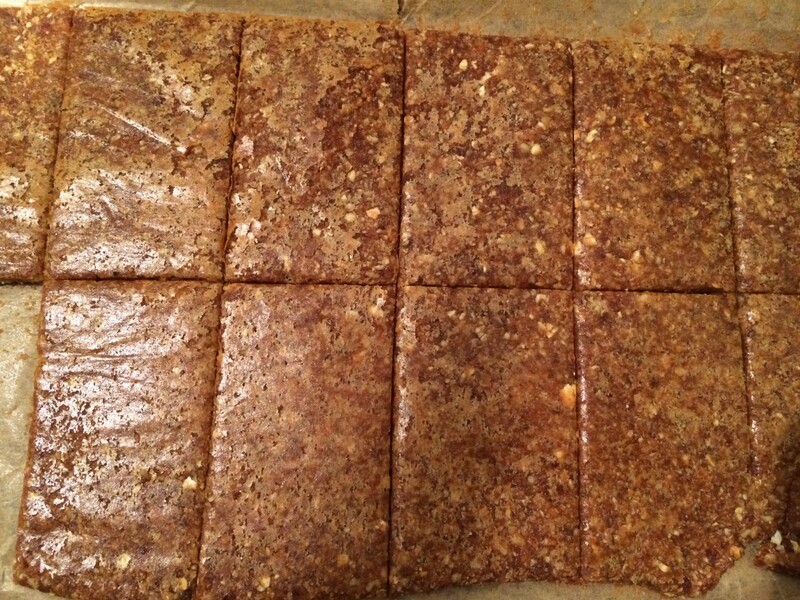 These sticky date slices were a staple snack in our family and it’s only as an adult when I asked for the recipe that I realised just how good for you they are! To me they’re still a fantastic sweet treat, I just get to enjoy them even more now! I suspect that if you made these into balls rather than slices then they would be in the ‘powerball’ category of healthy snacking. But let’s not ruin something delicious by loading it down with too much virtue! 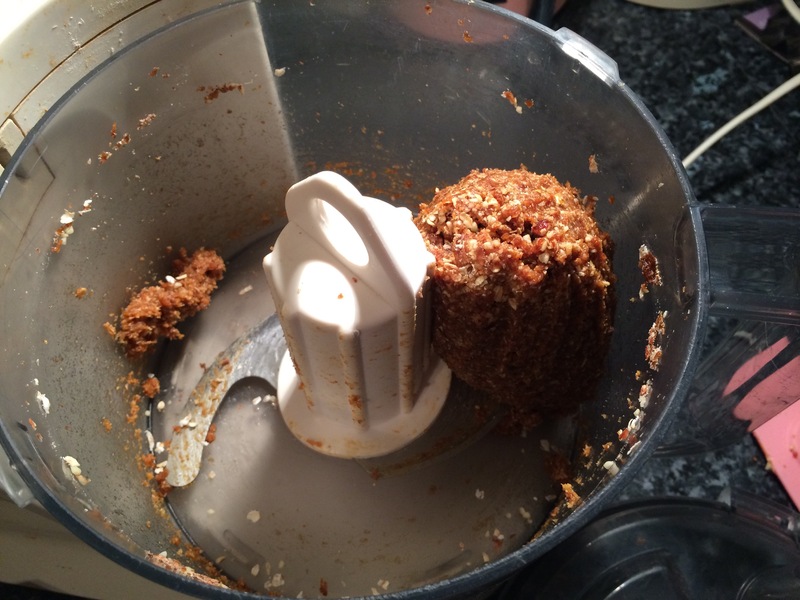 – Put the dates and the almonds in a food processor and blitz until all chopped up. You can go for longer if you want a smooth slice, or leave it chunkier for more bite. – Add the oats and honey and blitz again. – With the motor running add the water slowly until it comes together in a ball. You may need a little more water if your dates were very dry but don’t add too much or you will get a VERY sticky slice! – Turn out onto baking parchment and roll out to a little under the size of an A4 piece of paper. About 5mm thick. 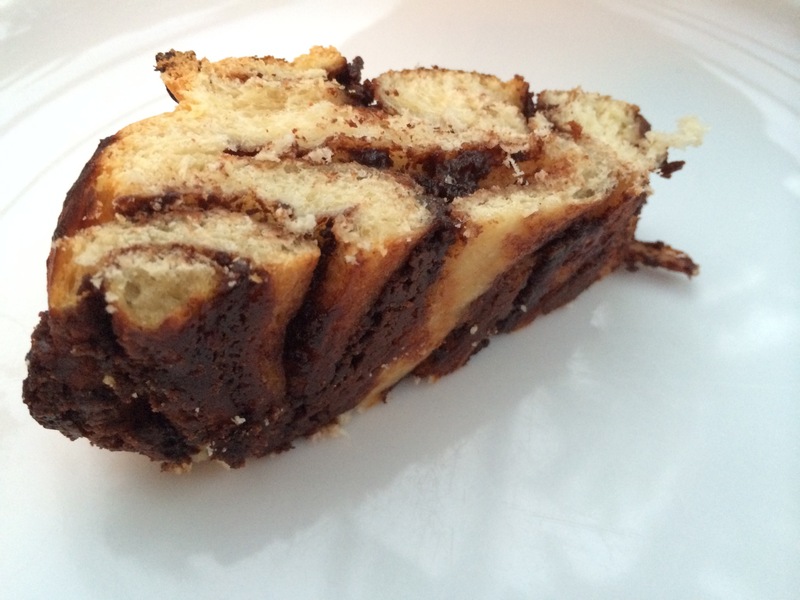 – Place in the fridge and chill for about an hour. Merry Christmas!!! Do you like the snow? I have a new obsession. I don’t know what came over me. All of a sudden I woke up one day and out of nowhere I NEEDED to have cinnamon rolls! I couldn’t think about eating anything else. I just wanted cinnamon rolls. 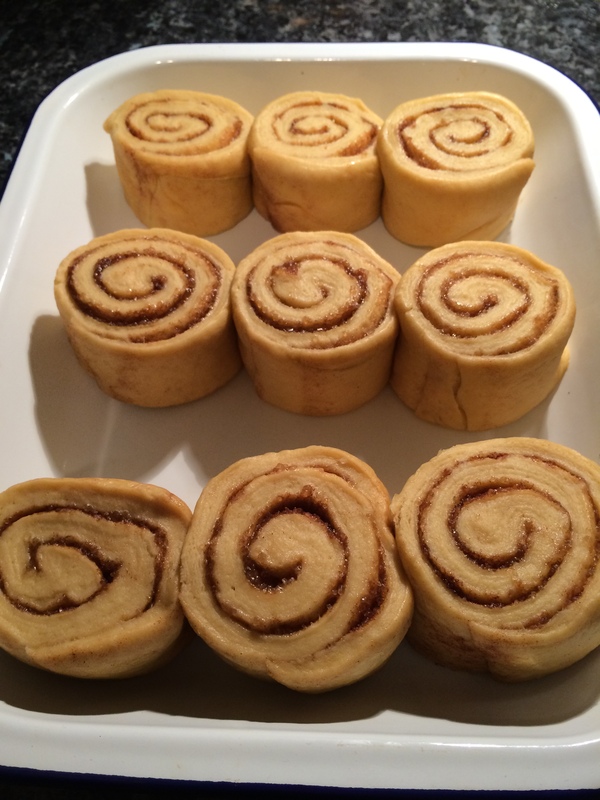 Soft, spicy, pillowy cinnamon rolls. Now, for some people I understand that this is quite a normal state of affairs… but I don’t like cinnamon!!! Yeah, well that’s a thing of the past! I love cinnamon now! For about a week, I kid you not, I pretty much existed on a diet of cinnamon rolls. Nothing else. I couldn’t stop thinking about them and craving them, and I had to get the recipe exactly right. I had to pursue this cinnamon roll nirvana! Happily, I think I succeeded in my quest. These cinnamon rolls are everything I dreamed of. They are soft, sweet, squishy, delicious, moreish… I’ll stop now, shall I? 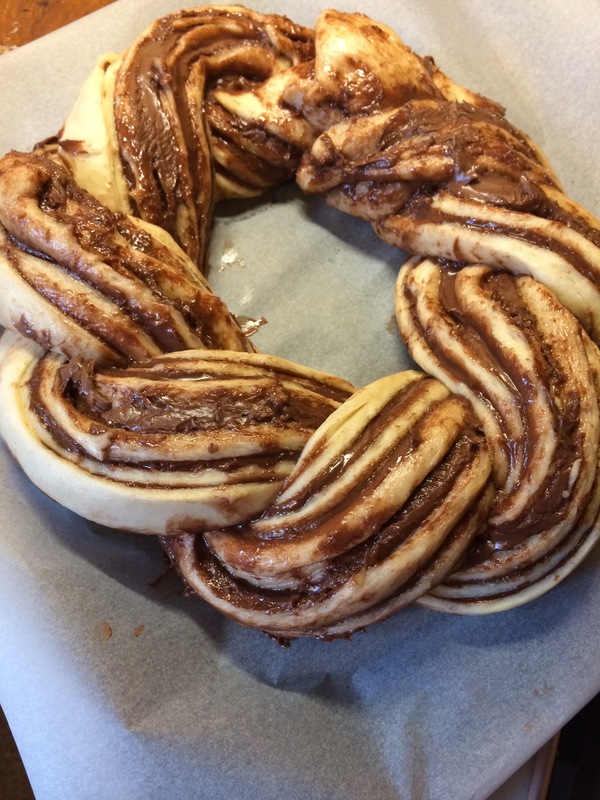 Having attained my perfect cinnamon roll I am pleased to say that I have moved on to new experiments but luckily even excessive consumption hasn’t put me off these… in fact, I might just make up another pan tonight, it would be a shame not to! – Weight out your flour into a large mixing bowl. – Put the yeast on one side of the bowl and the salt on the other. – Mix gently with your hand to combine everything. – Add the butter, cut into chunks, and rub it into the flour until all chunks have disappeared. – Make a wekk in the centre and add the egg and almost all of the milk. Hold back a little milk in reserve. You probably will need it, but you may not. – It should come together into a smooth dough, if it is still floury add the remaining milk. You want a soft, smooth dough, not too sticky, not too dry. – Turn it out on to a lightly floured worksurface and knead it for 10 minutes until soft and elastic. – Place in a buttered bowl and leave covered in a warm place for 1 hour or until doubled in size. 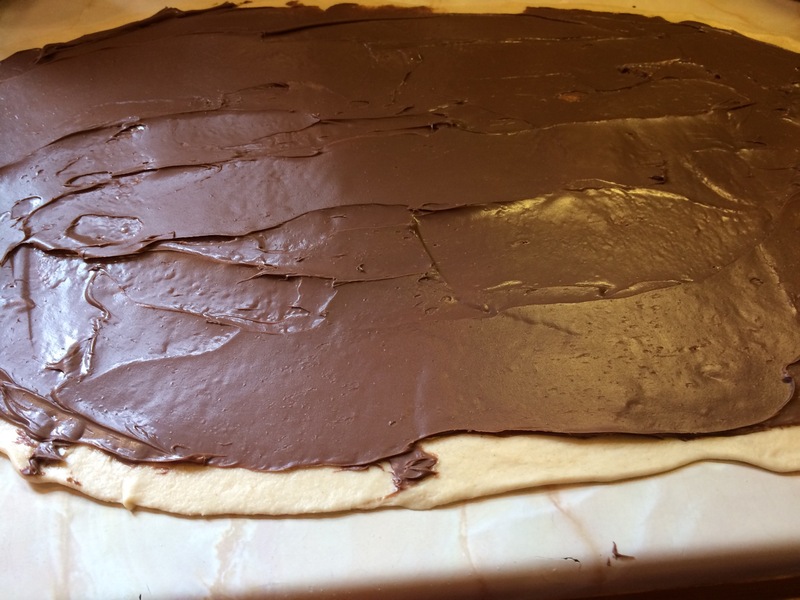 – Turn out the dough on a lightly floured worksurface and roll out into a large rectangle, about 30cmx40cm. – Brush the dough all over with melted butter. 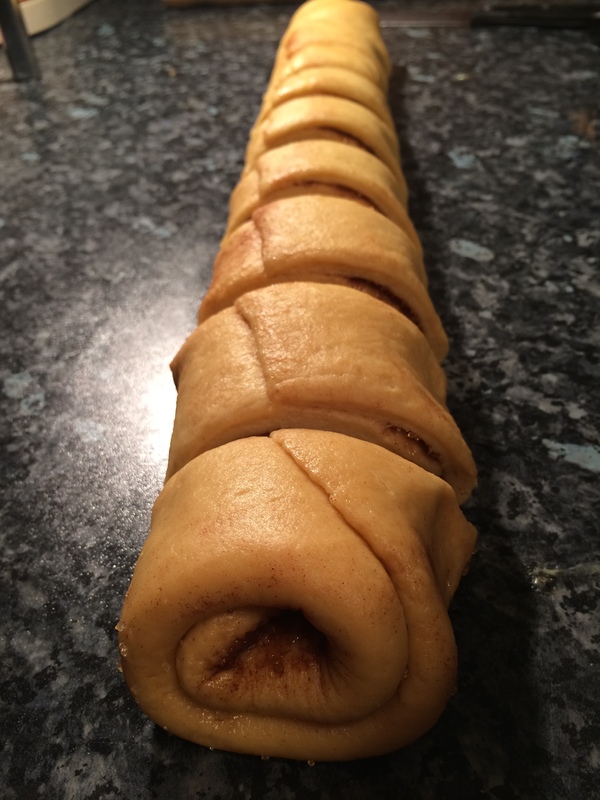 – Starting from the long edge furthest away from you, tightly roll the dough towards you into a tight spiral. – Press the edge of the dough gently to seal it together. – Place in a large, high baking dish cut side up. – Leave to rise for 30 minutes. – Bake in the oven for 25 minutes at gas mark 6 / 200C. 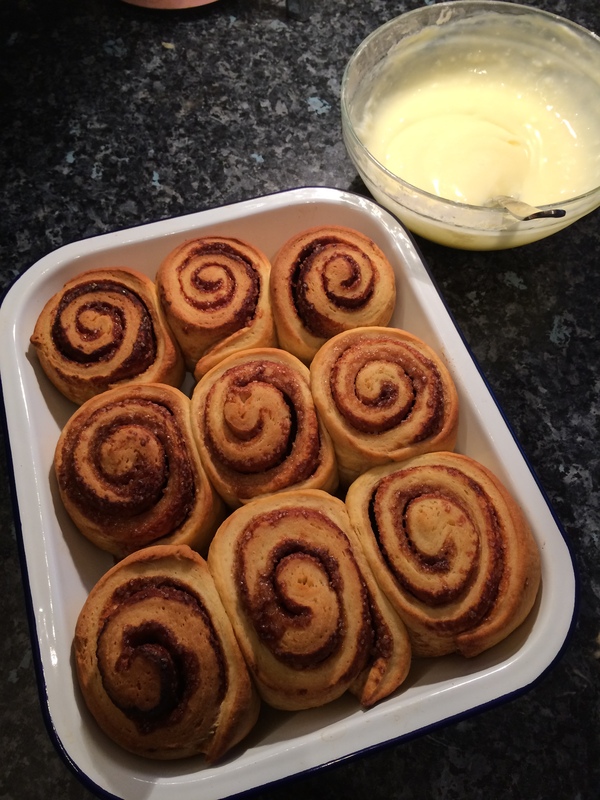 The centres should be springy and the dough lightly browned. – For the frosting mix together your cream cheese and icing sugar until smooth. Try to work it as little as possible. Place it in the fridge to refirm it as it will be quite runny to start with. 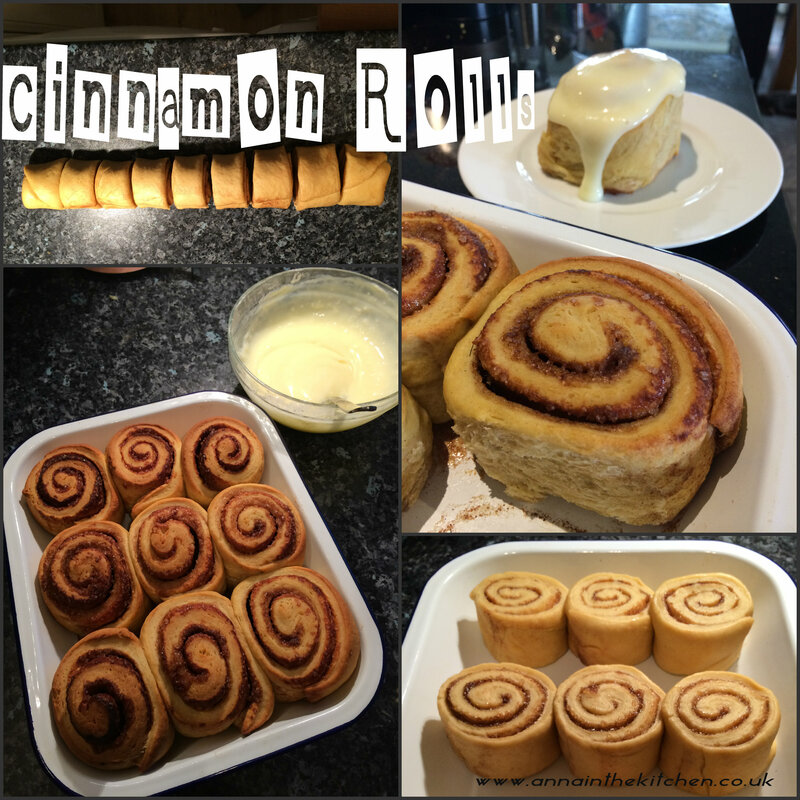 – If you are not eating the cinnamon rolls straight from the oven simply microwave each one for 30 seconds before icing and eating! There is little in this world more pleasurable than unrolling a warm cinnamon roll as you consume it! 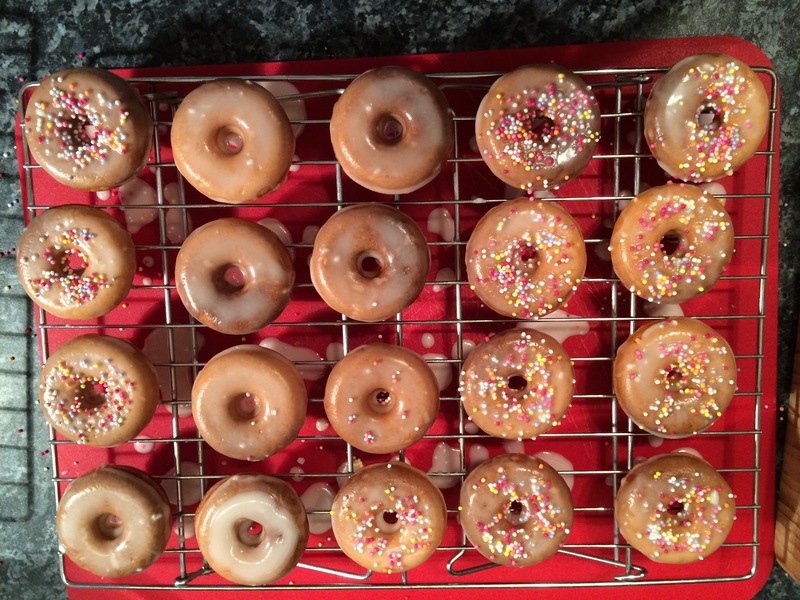 About two years ago I bought myself a mini donut maker… as you do. I used it once with the recipe that came with it, was pretty unimpressed, and it has lived in the back of the cupboard ever since. Until I got a craving for donuts that is! I just so happened to have reorganised the cupboards earlier in the week and so the mini donut maker was at the forefront of my mind! These are so quick and easy to whip up it’s ridiculous! 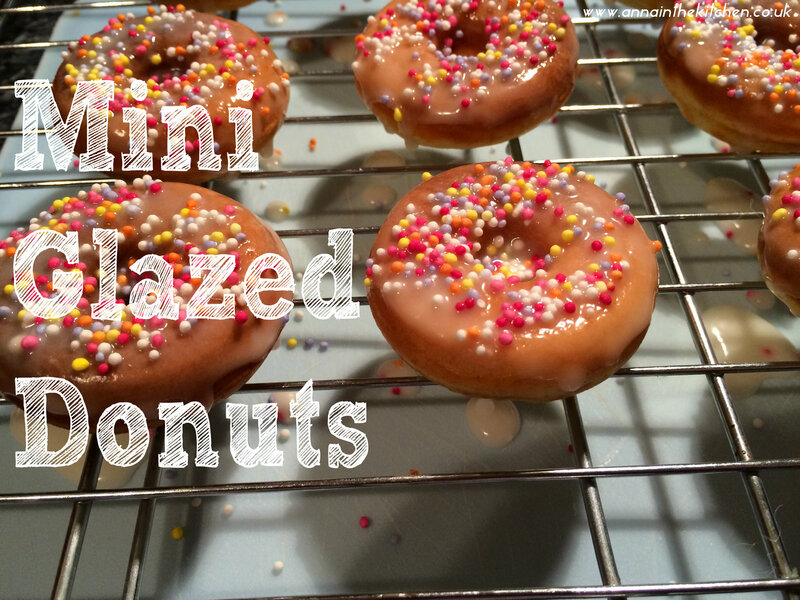 Even just using a mini donut pan or something in the oven I’m sure there would still be really quick. 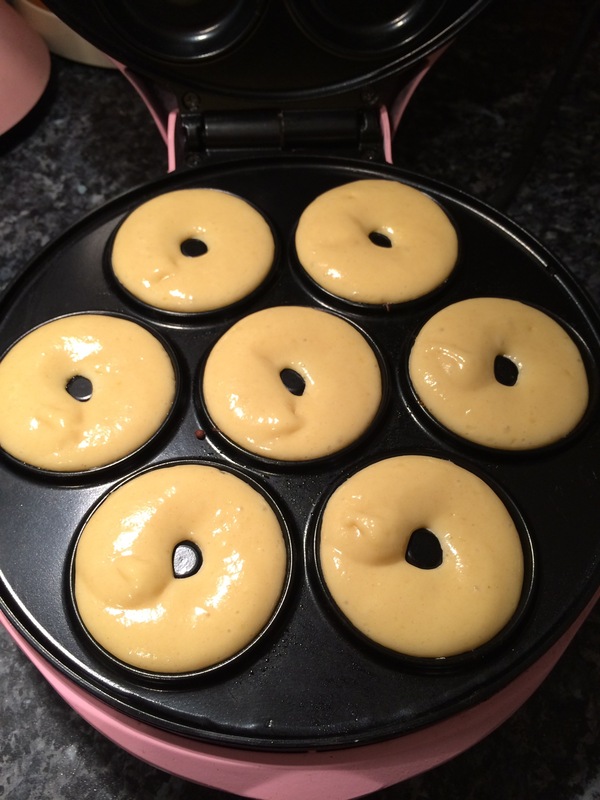 The batter takes about 5 miuntes to prepare and the donuts cook in the mini donut maker in 5 minutes. 10 minutes is all it takes to have fresh cooked donuts!!! I had been doing so well on the healthy eating too. Alas, those days are probably gone now that I have figured out how to make delicious mini donuts at a moment’s notice! 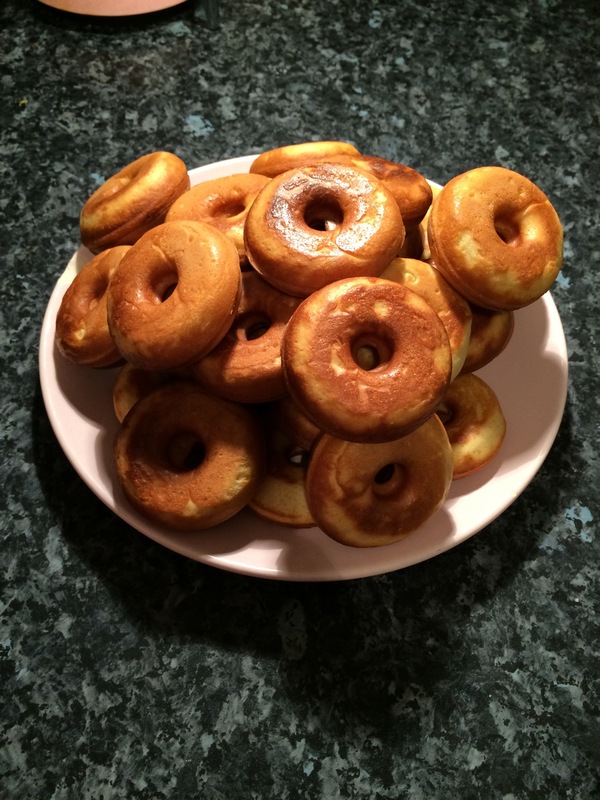 Although as these are cake donuts and baked rather than fried the calorie count is vastly reduced, which is good! And the flavour possibilities are endless too! I can’t wait to experiment! 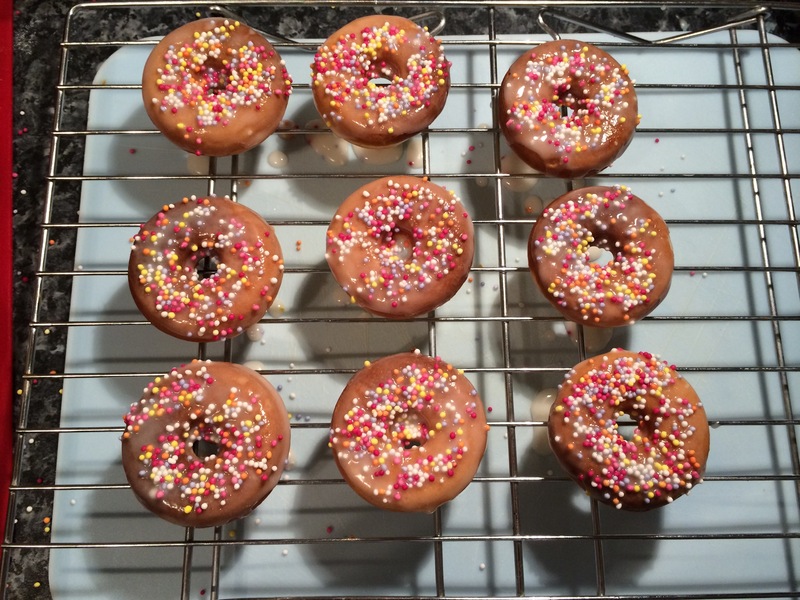 For now I’m pretty happy with these simple glazed donuts… and the sprinkles. Sprinkles are awesome! – Melt your butter in a large pyrex jug or medium bowl. – Add the milk, egg and vanilla and whisk together. – Add the sugar, flour, baking powder and salt and whisk together until they all form a smooth batter. – Lock the lid on and wait 5 minutes. – The donuts should be nicely coloured top and bottom. If the tops are still pale give them a little longer, sometimes the first batch need a little longer until the machine is properly up to heat. – Gently use a fork or teaspoon to lift the edge of the donuts and them place on a plate or wire racks to cool slightly. – Now for the glaze! – In a small bowl mix the icing sugar, vanilla and enough water to make a nice runny glaze. You don’t want it too stiff or you get a white icing rather than a transparent glaze. – Prepare two wire racks with trays or chopping boards underneath to catch the drips. – Take each mini donut, dip it in the glaze, flip it over to coat the other side, then lift out, allow the excess to drip off a bit, then place on the wire rack to set. – Repeat with all the donuts. – If adding sprinkles be sure to add them while the glaze is wet, about every 3 donuts gives you enough time. – Allow to dry completely on the racks before placing in a box or tin to store… some donuts may not make it and may have to be “tested” before they are completely dry… that’s a shame! As a busy single gal with a job, a home, a garden and puppy to tend to these days my cooking choices are dictated mostly by time. I am a big fan of batch cooking, my freezer is worth its weight in gold, and if I can make a dish do double duty and provide me with not one but two meals I am all over that! This is a perfect example of multipurpose cooking. I had a light supper for 2 and breakfast for 4 days out of this one quick session in the kitchen. If that’s not efficient I don’t know what is! I started with the bruschetta. I had visited York’s Food Festival on Sunday and grabbed a Haxby Bakehouse baguette. After having some with roast chicken and salad on Sunday night, and another hunk for Monday lunch’s sandwich I was still left with about half a baguette day old baguette. Perfect for bruschetta! Once you’re done these will also keep well for an extra few days so don’t worry if you don’t want to eat them all at once, they’ll keep! – Heat your oven to Gas 6 / 200C. 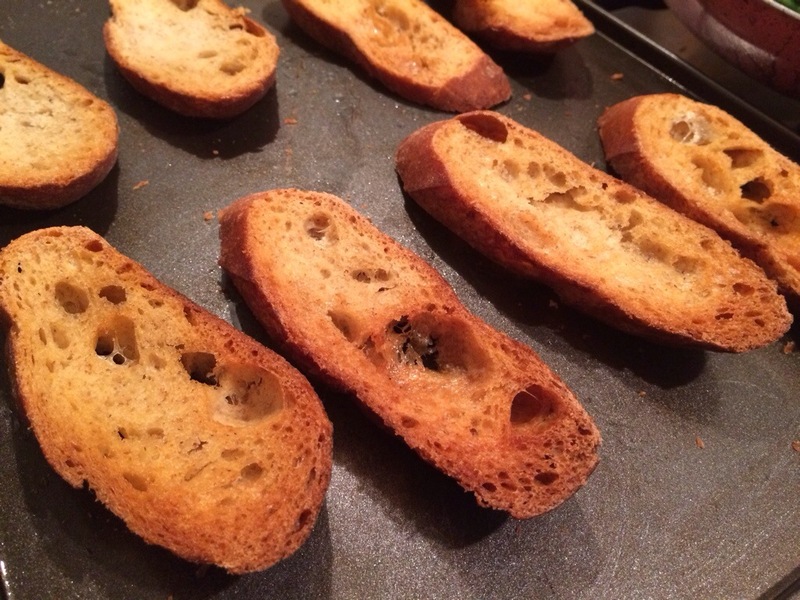 – Slice a baguette about 1/2″ thick. – Place on a baking tray and spray both sides lightly with olive oil. – Place in the oven and bake for ~15-20 minutes. The longer they’re in the crunchier they get! It’s up to you how dark and crispy you want them to be. You can stop when they’re just lightly browning and more toast like or keep going until they’re totally crisp and a deep, even brown! – Keep warm if desired or allow to cool and then they can be boxed up to keep for a few days. Now for the Topping! Basically, I grabbed what I had on hand, which was mushrooms, asparagus and spinach, but the possibilities are just about endless! – Heat a splash of oil in a frying pan. 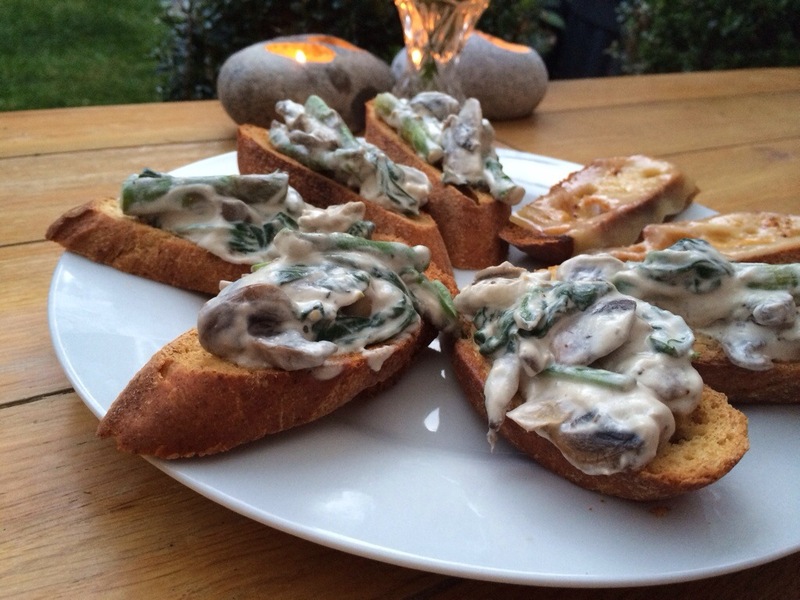 – Thinly slice the mushrooms. – Snap the woody stems off the asparagus and slice into bite-sized bits. 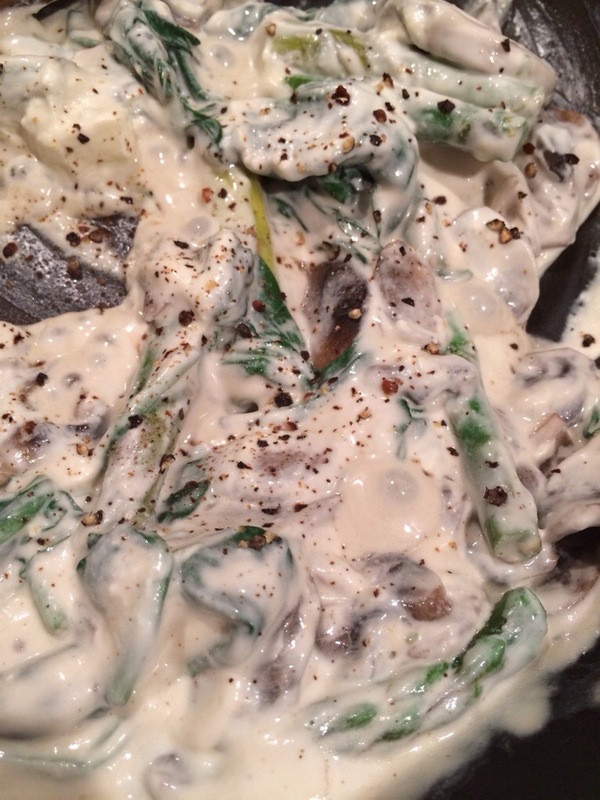 – Add the asparagus and stir while cooking for about 3 minutes. 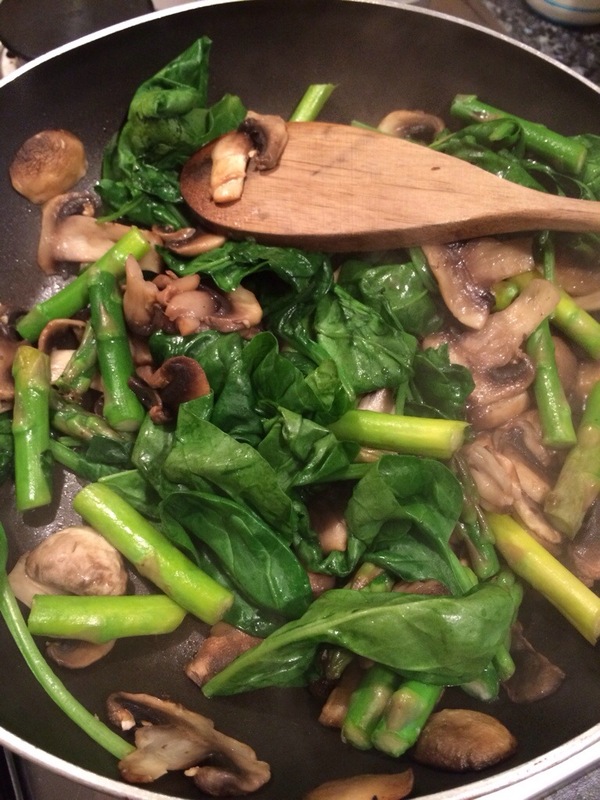 – Add the spinach to the top of the pan and leave to wilt over a low heat giving a little poke to mix it if necessary. – Add the cream cheese and creme fraiche to the remaining mixture, stir until melted and well mixed. – Add a sprinkle of salt and a good grind of pepper to taste. Carefully spoon on top of your bruschetta and plate up. A little shaving of parmesan is a delight too! (And spot the cheeky little cheese on toasts added to the plate, I had 2 spare bruschetta and some Monterey Jack in front of me, add a quick blow torch et voila! Cheesy Toasts!) I suggest a nice chardonnay and a sunny evening to enjoy these but they would be just as good by the fire on a winter’s evening too I’m sure! Now, what were we doing with our mysterious other half of the veggie mixture? 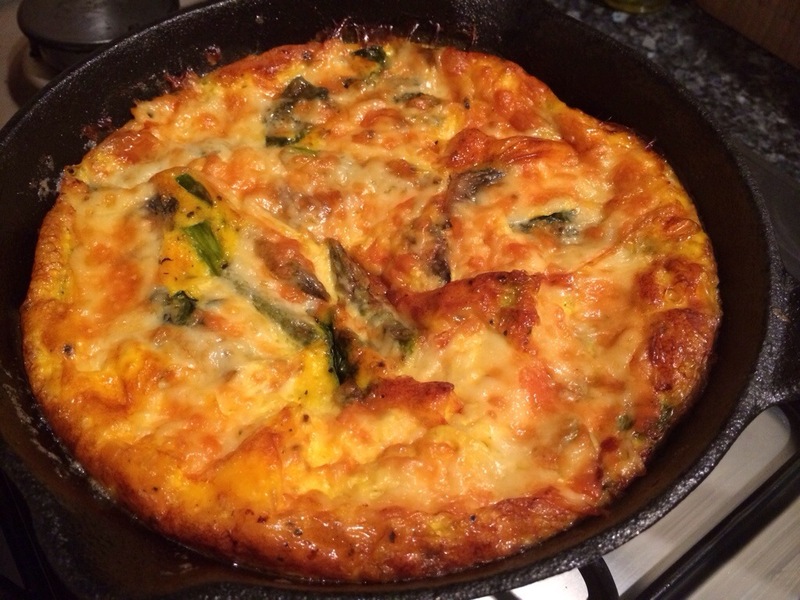 Well, this is where the Frittata comes in! Or you can call it an omelette or a crustless quiche or whatever you fancy, I kinda just like saying Frittata in a kinda Hakuna Matata fashion! – In a jug or bowl beat 4 eggs, a splash of milk (~50-75ml), a pinch of salt and a grind of fresh black pepper. 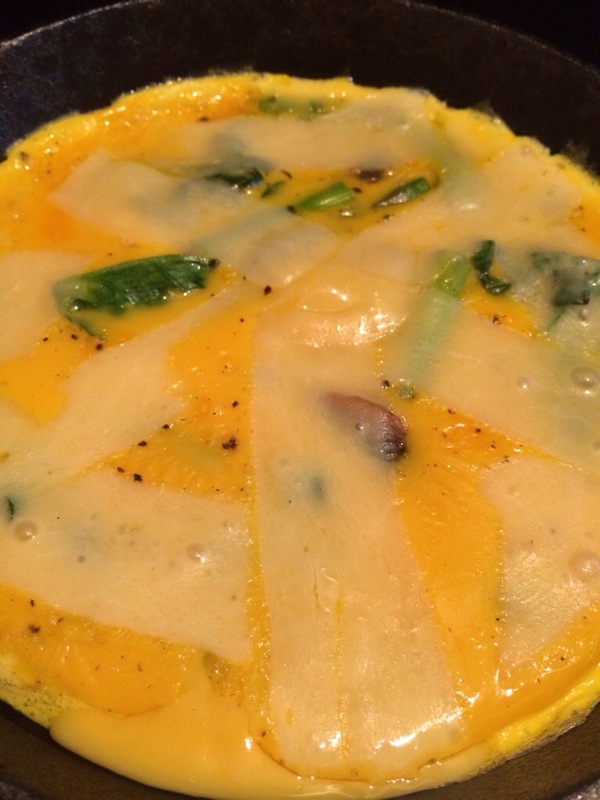 – Add the veggies to the pan and pour over the egg mix. – Top with slices of cheese, I went with Monterey Jack but any cheddary cheese would work. – Place in your preheated oven and cook for about 20 minutes until set through. It will puff up beautifully! 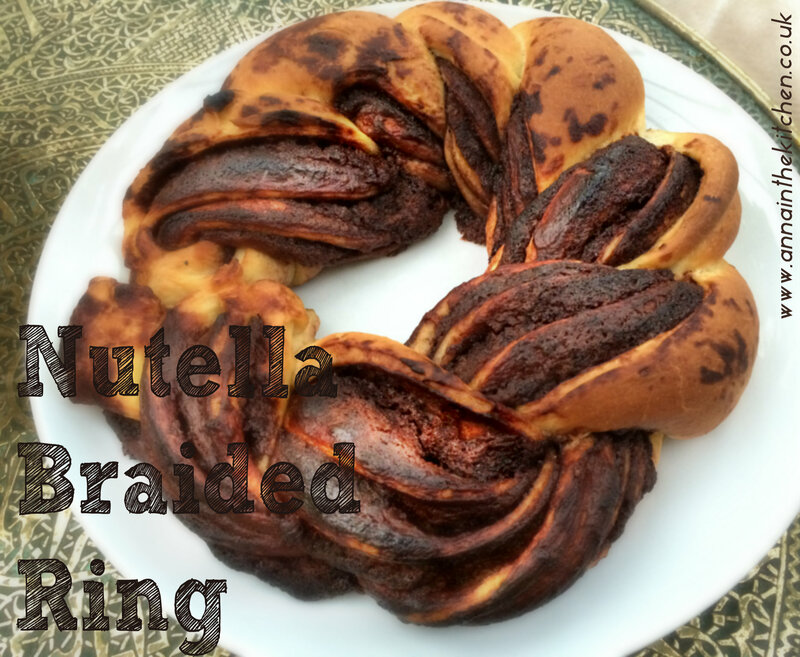 – Remove from the oven and allow to cool (it will sadly deflate but no matter!). 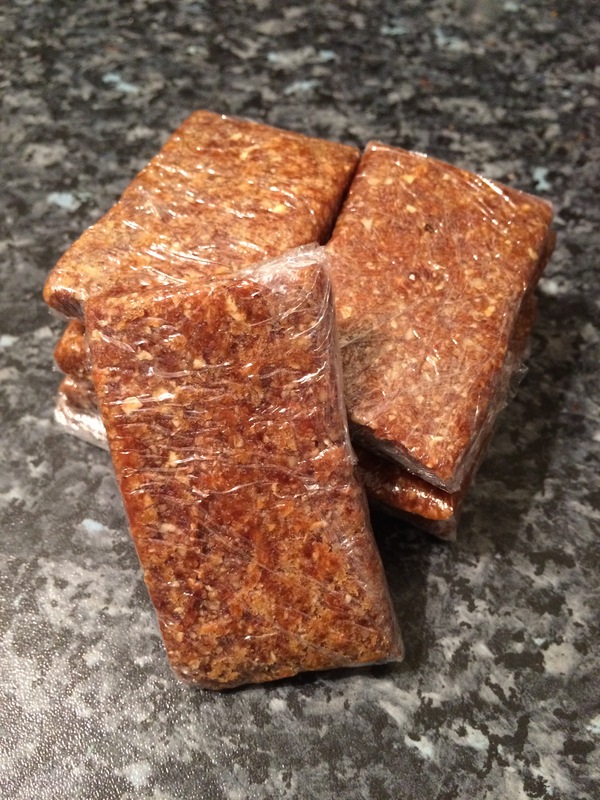 – Slice into 4 and place in a box in the fridge ready to grab a slice for breakfast each day. 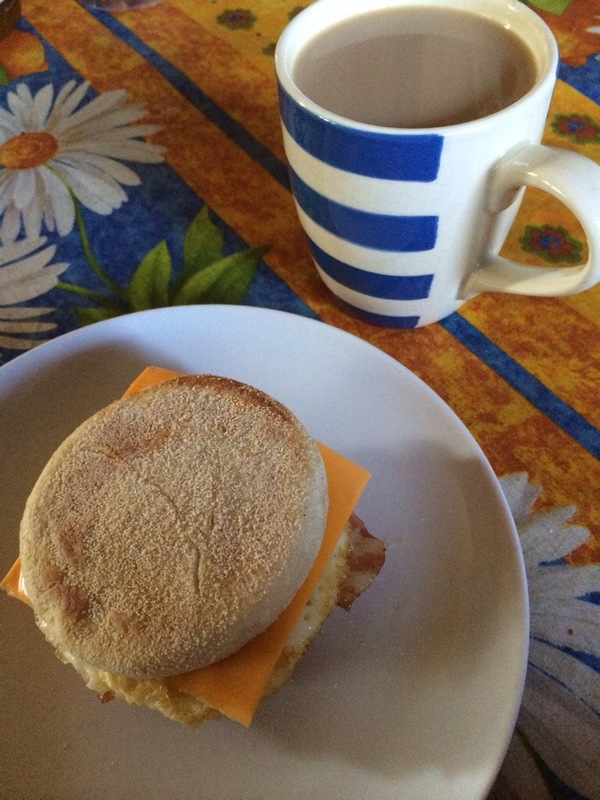 You can eat this hot or cold, if you would like a hot breakfast simply heat in the microwave for 1 minute. So there you go, supper for 2 and breakfast for the next few days in one quick dash around the kitchen. The fritatta can bake while you are eating your bruschetta, just remember to go back and get it out of the oven or bad things will happen!